Suddenly it gets ugly – but these are still the good times. It’s confession time among the Detroit automakers: GM, Fiat Chrysler, and Ford all got ugly, in unison, in one day, something we haven’t seen since the Financial Crisis. Back at the end of May, GM shares (GM) were trading at $38 when it announced that SoftBank, the Japanese company that is blowing borrowed billions left and right, would invest $2.25 billion in GM’s self-driving car unit Cruise. By June 11, GM shares had shot up to $45. But this morning they’re at $37.16. That’s a 17% plunge from June 11, including the 5% drop Wednesday and today. In its earnings report Wednesday morning, it lowered its profit outlook for 2018 by 5% to 9%, as its operating profits in its North America business plunged 23% in the quarter. GM’s “adjusted” profits had hit a record in 2017 of $12.8 billion. That record is now moving out of reach. It blamed currency woes in Brazil and Argentina and raw materials, primarily steel and aluminum, whose prices – “driven by a variety of market forces,” as CFO Chuck Stevens said – rose more sharply than it had expected when it gave its guidance at the beginning of 2018. Fiat Chrysler didn’t help. Wednesday morning it announced earnings and slashed full-year earnings guidance by about 7%. Its shares (FCAU) on Wednesday and this morning have plunged 13% and are down 31% since April. Ford’s turn to confess came Wednesday evening – and it was ugly. It’s Q2 earnings plunged nearly 50% to $1.1 billion, as total revenues fell 2.4% to $38.9 billion. It slashed its earnings projections for the full year by about 11% and announced another restructuring program that could drag out for three to five years and cost $11 billion. Or whatever, because in April, CEO Jim Hackett, the new guy, had announced a rejiggering process that would cost $25.5 billion through 2022 that included abandoning all car lines in the US, except for the Mustang [Carmageddon for Cars: “Cars” Are Scheduled to Die]. 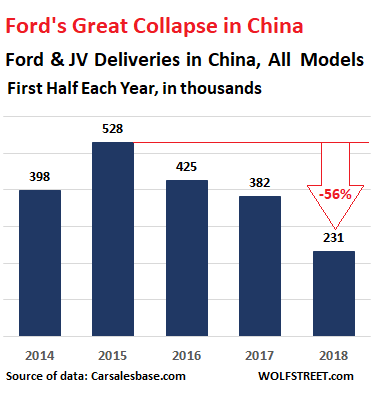 Ford blamed the current set of problems on a disruption at a supplier for its high-margin pickups, rising costs of commodities, particularly steel and aluminum, difficulties in Europe, where it had a $73 million operating loss in Q2, and collapsing sales in China, where it had a $483 million operating loss in Q2. Ford shares (F) dropped over 5% this morning to $9.98, the lowest since 2012. Not since the Financial Crisis have we seen earnings warnings by the three Detroit automakers balled up like this, all in one day, in unison. But this isn’t the Financial Crisis. This is as good as it gets. The economy is growing. GDP in Q2 is projected to rise, depending on who is doing the projecting, between 2.8% and inexplicably 4.5%. Deliveries of new vehicles in the US peaked for the big three Detroit automakers in 2015 and have edged down since then, but they have raised prices on their profitable and hot trucks, SUVs, and crossovers, and in dollar terms, sales and profits in the US were solid – until now. So these ugly outlooks hailing down on the good times are rattling nerves and leaving folks to wonder what will happen to the automakers when the times are no longer this good. I am a frustrated Ford shareholder. It seems to me car & truck sales are leading indicators of the US economy. All of the car makers found new ways to sell cars to many unqualified buyers over the past 5 years, offering loan terms as long as 7 years. They qualified for aggressive lenders because of longer amortization terms. As long as we have full employment, these owners will keep paying. If unemployment increases, these lenders will be getting some cars back. Full employment? Do you know how many people are out of the workforce since prior to 2007? Face it – cars are not affordable. Not under the current business model. The Federal Reserve has forced the price of all assets up, cars being one of those assets. Carmakers should have been focused on changing their business model to adapt to this asset bubble. No, instead they colluded in the fraudulent subprime lending schemes. What should they have been doing? Looking for distribution efficiencies like by-passing the dealerships. Elon Musk has one thing right – buyers should have access to factory direct leasing and purchasing alternatives. I have worked as the CFO at a dealership – the markups and rebates/kickbacks are huge. It’s a license to print money until the lending freezes up again. You got that right.I bought a new high end car just for the hell of it.In the first year I put on 5000 miles but every 8 weeks my little on board computer told me I needed a service.The dealer said that to qualify for my warranty I had to take it in.I explained that in fact it had sat in my garage for 6 weeks while I was in Europe.He then had the nerve to say that the oil and fluids could decay through non use !!! I explained I used to race cars and knew a bit about them.I also explained I wouldn’t be buying one of his again…Which I didn’t. Wut? No margins in new vehicles? For the dealer or the manufacturer? I’ve been out of the business for 5 years, but I can tell you the “sticker” is meaningless to the dealer. Still plenty of profit, especially if the dealer hits the monthly sales quotas and then the rebate checks start rolling in. Dealers only encounter problems when inventory starts to back up and they have to pay floor financing to the manufacturer and don’t get the monthly/quarterly rebates. ..just start offering 25 year mortgages on cars! Then we can all drive around in luxury, high-end automobiles, like the big shots we know we want to be. Fake it ’til ya make it! Joking aside, it really wouldn’t surprise me in these weird, surreal financialized times, wherein usury is totally normalized, if this actually came to pass. Dual income, 250K, 25 year auto loans – the ultimate can kicker..? Here is an article that describes some aspects of the labor market that the Fed and other gov’t officials seem to overlook. Bottom line: Unemployment is not 4%. they already are. but then they sell them to a new mark. Timothy, has it ever occurred to you that vehicles are no longer the “in” thing because the average bloke has spent all his money either paying for his house or for rent? Between a roof and a vehicle, the roof takes priority, hence less and less money will go into the automobile sector for the forseeable future. Get out of this investment while you can. With the advent of Uber, EVs and self-driving tech, increasingly more folks will take public transport, or resort to car-pooling or car sharing modes; which means less auto sales per population. We could end up with a case of extremes, where those who own cars will either be the very wealthy or those needing one to live in it. Still a good year for auto sales, over 17 million new units projected? My PCAR is up nicely from the alert you provided. Wolf, thank you for keeping up such an informative site. Today is my 14th year anniversary selling Chrysler product so I figured I would try to add some ground level insight. I sell approx 300 new and used cars per year and I can say this has been probably one of the toughest months I can recall. Not that I’m not selling cars but it’s just becoming difficult to get the wheels on the road. A main culprit is FCA not getting parts and vehicles to the dealer in a timely fashion. Waited 3.5 weeks to get lost keys remade for a vehicle at a storage yard. Cars piling up everywhere. Service can’t get parts to fix recalls and such. Total train wreck. I’m in the Detroit area with about 95% leasing at my store so the interest rates haven’t really impacted my business but I can imagine other states are feeling the pain. Rolling over thousands in used car lack of equity doesn’t sit well with the lenders. We went in the crapper about 6 months before it caved in last time, and we came out of it about 6 months before everyone else. Interesting to see if”it’s different this time”. Lease penetration of 95%?! Wow! You guys are good. Interest rates on auto loans for prime customers are higher than they were, but they’re still relatively low. I don’t think they have reached the pain threshold yet. But that’s coming down the pike. Wouldn’t a lease rate of 95% drive down used prices given the constant turn over on leased vehicles. This can’t be common across the board or the used market would be overstocked and able to bring down used prices. And why are they leasing? Usually because they can’t make the purchase payments plus it’s easier to approved for the lease. Typical Advice from financial advisers: Never lease a car. 95 % leases is a very negative economic indicator. Closely related to why renting (or signing a lease) is the only alternative for a place to live. Leasing cost is not much different than depreciation for driving a 2-3 year old vehicle. Never buy when you can lease if you want to be driving a newer vehicle. 1. Financially independent and so not in the topic I’m discussing which is financial prudence. He has no need to be prudent and there is no law against throwing away money. Why do some women have a hundred pairs of shoes? 2. Financially and/or mechanically illiterate and doesn’t realize that a 2 year old car with 30 K is not just as reliable as new, it may be more so as new cars often have bugs. Sure its covered but you don’t want to haunt the dealership. Note: how would you know the clean 2 year old car is NOT new? By the pointless changes in rear lites etc. so dear especially to US manufacturers only for the purpose of letting you know which year it is. in sheer economics, the car is only beginning to justify its purchase after 2 -3 years. No other capital outlay is churned as senselessly. 3. Has no choice within his budget for that model, which I’ll bet is the majority. Why else would they harp on the lower monthly payments. There is one other category, but I don’t know how big it is. But I do know one young reporter whose car was written off and HAD to lease a new car. No one would finance a used one. could have purchased the same auto if they had chosen to? Of course there are people who can buy, but always want to drive new, so maybe there are a lot more than I thought. When we were shopping for a car in Detroit area 20 months ago, the dealer told us that his lease rates were up in that 95% area. It’s crazy from my standpoint but that’s the facts. I bought a CPO off lease car. Saves money. hmmm, supply chain disarray. hmmm. New cars are more reliable, durable and longer-lasting so shouldn’t we need less of them? Longer lasting only exists in Arizona and California. The rest of us suffer the cancer called rust. It still eats metal and corrodes aluminum. This isn’t the 1970s. Cars are much more corrosion-resistant than they used to be. My last car was 5 years old and rusty from Ontario salt I would assume since it came from Ontario when I bought it used. My current vehicle is a rusted out truck from the 2000s because of salt on Alberta roads. The metal can be as new age as you want, there are some things that you can’t stop. Rust is one of them. If you don’t have rust, you are rebuilt your vehicle(Paulo) or you aren’t exposed to the rust belt or the east coast. Superficially yes, they are less prone to rust. Electrical connectors, nuts, bolts, brake lines, etc. not so rust proof. My punishment for using mass transit is driving a perfectly good 15+ year old car to the junkyard with +/- 100k miles on it due to dashboard engine lights needing expensive repairs every year at my DMV inspection crucifixion. How I long for a 1967 Chevrolet with a 250 6 and three on the tree manual transmission – with the new rust preventative body panels. We are accustomed to going 5-6 years long on loans including features on transportation appliances which have no relationship to the use-case of the appliance – moving bodies from point A to point B as cheaply as possible. What I see stuck in bumper to bumper rush hour traffic is astounding. Modern cars are made of galvanized steel. So they don’t rust out nearly as badly as old cars used to. Now if you live in a snowy climate with road salt all over the roads, I’d recommend washing the car as often as possible in the winter. Because road salt’s very corrosive. My Toyota PU is now 32 years young. I restored the body for $2500 cdn a few years ago, and am thinking of replacing it, but what for? It still runs great and several times per year i have people stopping me and ask if I was thinking of selling? Apparently, it is considered to be the ultimate off road truck for males with arrested development. :-) By the way, the paint job is VW racing green and it looks very good….no rust!! Time to roll out the 30 year truck mortgage.After all other homes qualify! Seems like one bullet the industry has dodged is the big price drop in the value of used vehicles which would rip through the entire industry eventually adversely impacting residuals of leased vehicles and subsequently crushing the leasing space. Why has it not happened yet. Side note, some are saying these good times have ample room to run like years, your thoughts? Wondering if when the US economy starts to slow it happens at a much more rapid rate than anyone thinks it can. Sorry for off title rambling. Wolf, Are the automakers dumping lease turn ins overseas? They don’t need to. The market for late-model used vehicles is strong, and auction prices are high. There is a lot of demand for these cars, given how expensive new vehicles have become. There is a lot of demand for good used cars — and that makes sense, given the sky-high prices of new vehicles. Auction prices have been very strong, and dealers are loving it. It’s likely that the UV market will hit a record this year. So much for the BOA analyst who said used values would plummet by 50%. Thanks for your comments. I think Hurricane Harvey/Irma kicked that can down the road a bit; if I recall correctly, we were at or near the inflection point of 2-3 year lease trade-ins flooding the market, and then a million cars got destroyed in a matter of two weeks. This absolutely happened in 2008. And then our idiot govt came along with cash for clunkers which obliterated the low dollar used car market. The Fed is supposedly raising rates to cool down the economy, gee it must be working. Maybe the Fed takes a play out of the past and does a large overnight raise. Just bought a new car his week. Tried to deal with the Ford dealer on a CUV. Nope. Tried Chevy and Buick dealer. Neither would come off more than 20% of list + add ons. Tried for a Jeep Compass or small Cherokee. Nothing. Each dealer said they didn’t need to discount. Went out of town and bought an Audi Q3. Got almost 25% off list, plus if I financed it the dealer would pay the first months payment, Audi would pay the second months payment and since I was trading in our Audi for another Audi I would get a $1000.00 Loyalty discount. All this was AFTER negotiations. Never saw anything like this before. I bought the basic Q3, not a Quattro. List $36K. Cost me $30 K + taxes etc. Traded my 2017 A3 with 6,000 Miles bought last November. Went to Hilton Head Audi, South Carolina. Don’t mind giving them a plug because they really gave me a nice deal. My local dealer in Charleston, SC wouldn’t give me any kind of a deal. Wanted $10K at least. I walked out. Frankly, I was surprised a pricey place like Hilton Head would give me a great deal. American cars are poorly made that’s the problem. Stopped buying them many years ago, and I am appalled at the quality compared to their foreign competitors. Looked under a new ford car I rented once and the entire undercarriage was lined with a spongy foil. What for? Insulation? Countless bad encounters with American cars. Invoking the financial crisis is not necessary. Most sectors are doing well, and the good economy seems to be the reason. Expect the markets to rise on low volume through August. If American cars are so poorly made, why do Japan and Germany protect their home markets so much? Are they afraid of a little fair competition? There are no tariffs on US cars entering Japan. But there is a 25 % tariff on full size trucks ( F 150 etc.) entering the US. The Japanese market makes the competitive US market seem like a play pen. Toyota, the innovator of modern production, rules the roost with five other domestics scrapping for the rest. The US has the Big Three domestics. Imagine the Big Six in a population one third the US. It helps that they put the steering wheel on the right for the Japanese. like they put it on the left for us. The Japanese bureaucracy decides what is allowed into Japan. It’s quite amazing how this works. I hear the details every day from my wife, who works for a company that exports goods from the US to Japan. Japan is using administrative barriers. This is much more subtle than tariffs. If they don’t want it in, it doesn’t get in because getting it over the administrative hurdles would cost so much and take so long that the math no longer works out. There is a reason why Japan has a gigantic trade surplus with the rest of the world. I was sure I’d hear about the non-formal barriers, or really harassment. 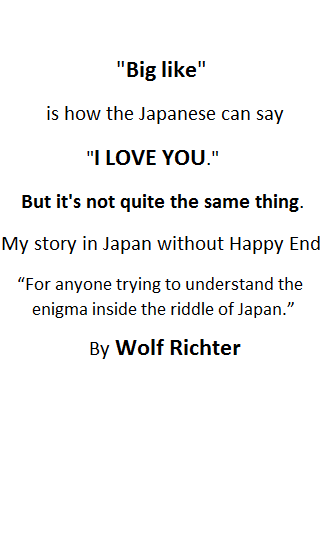 Yes Japan is like that and not just for imports. For the smaller or medium outfit, it may not be worth it to wade through the bureaucratic red tape. A Ford or a GM has a trade legal dept that will acquire local and political representation that will dig in and fight for years, forcing the issue upstairs to the diplomatic level, where if necessary it becomes a SENIOR govt to govt issue. But it has to be worth it. There would have to be a really serious long- term demand for the product. Washington state did it for apples. It took years and each one is individually wrapped but they got it done. The reading I’ve done says there isn’t the demand for US autos. A full third of the cars on the road are ‘kei’ cars, sub- sub compacts or micro- cars two feet shorter than a Yaris with about 60 HP. So I guess we’re not competing for THAT market. Nor is the average Japanese building contractor going to be want to drive an F-150 though cramped lane ways OR put much more expensive gas in it. But not being an ‘old Japan hand’ I’d be interested to know which market sector is waiting to be filled by which US auto. We know which un-served US sector the Japanese (and others) filled when they broke in: the small economical car. Then the Civics turned out to last a long time. I still see a few of the original 70’s style around town. They aren’t all pretty, not collectors, just doing the job. Some K-cars too. Haven’t seen a Pinto or a Vega in years. Germany and Switzerland have small but very strong (read: prices do not matter) markets for direct US imports. However all attempts to sell US models such as the Ford Mustang through official channels have met with disappointing results. It’s a very strange market which is mostly run by a few private import companies with ties to both large car dealership groups in the US and shipping companies in Hamburg. Tesla’s used to be hot among the financial/management community in Zurich until a couple years ago but now they are considered horribly out of fashion (think showing up at a social event wearing a top hat and a monocle out of fashion) and are being exported to countries such as Italy where American franchises and brands go to die at the end of their cycle (see Blockbuster and a slew of other US retailers/consumer companies). And for all you people who think American cars are shoddily made… count your lucky stars you never had to work on a French car, especially the present ones. If you should ever feel like being roasted go on Electrik (i.e. the Tesla site) and wax skeptical about Tesla auto. I’m a Model 3 skeptic and it was like being an atheist at a revival tent. Best attended virtually. You are right. Ford=Fix or Repair Daily. GM=Garbage Motor. Most of their vehicles have troubles after 3 to 4 years and hard to to fix. In terms of reliability, American Vehicles are better than Germans but must worse compare to Japanese and Korean Vehicles. Can someone please tell Subaru that the market is bad, so it starts offering rebates. In contrast to the manufacturers described in Wolf’s article, Subaru is doing just fine in the USA where their sales numbers continue to rise. Heck, even I jumped on the wagon when I traded in my 2015 Forester for a great deal on a 2018 WRX a few months back. Makruger, I’ve defected to Subaru too; spaces in the driveway previously occupied by a Ford Escape and a Jeep Wrangler now hold a Forester and a WRX. The Big 3 don’t get much sympathy from me. Ford can’t make a profit building cars in Mexico, for the US, while paying Mexicans terrible wages, but Honda can make a profit from Civics built in Canada ? Hyundai can apparently make money building cars in Alabama and Toyota apparently makes money assembling Camry’s in Kentucky. Up until recently the Kentucky Toyota Camry was made by Subaru! I’m not sure how competitors get to building each others cars, but it seems to have worked out. I recall seeing Subaru engines in Toyota cars at a dealership once. Toyota owners part of Subaru. They aren’t competitors, they are partners. The Subaru Corporation (formerly Fuji Heavy Industries) is controlled by Toyota through several of those cross-shareholding agreements so widespread in Japan since the 50’s. You will also find Toyota controls in similar fashion Daihatsu and is one of Yamaha’s foremost shareholders. Subaru Corporation is basically one big Japanese keiretsu integrated in a bigger Japanese keiretsu: cars are just one of the things they manufacture. Among their many products are parts for Airbus and Boeing and they make some big fat profits from Japanese military contracts, such as providing maintenance for helicopters. They used to make excellent industrial engines as well but Toyota ordered them to shut their industrial division down last year, partly to avoid competition with Daihatsu (which designs and manufactured the Briggs & Stratton Vanguard engines) and partly through one of those dodgy agreements between Japanese keirestu, in this case concerning Toyota and Honda. This is a video about BMW i8 teardown. It is worth watching the full one hour. Who is buying the documentation? The Chinese. It’s been estimated that Japan’s unofficial weak yen policies keep the yen about 25% weaker than it would be if it were and un-manipulated currency. It’s amazing what a 25% subsidy can do for profitability, isn’t it? If American car companies were to ask for the same thing, there would be howls from “free traders” about how they can’t compete, when in reality, they are competing against the most protected and subsidized companies in the world. Take away the currency advantage, and you can kiss your Toyotas and Subarus goodbye. I keep reading that the yen is undervalued, but when I go to Japan with my dollars to buy things, an undervalued yen should make Tokyo cheap for me, compared to a big US city. But that is just not the case. Japan remains expensive for dollar-based folks. That said, after 20 years of price stability, compared to our 20 years of inflation, it’s not as breath-takingly expensive for dollar-based folks as it was in 1996 when I first went there. I think the weak yen makes imports more expensive in Japan. But as you say, keeping out imports is the point, so even the domestically produced goods are more expensive because there are no other options. I remember the stories about how one square meter of property in Tokyo was worth around $7,000.00, or at least thought to be worth that much at the time, before the bubble popped. China seems to be in a similar situation right now, but I think that bubble popping will be a lot more ugly. I’m in the market for a car. Usually buy used from private owners. Is there a way to buy cars direct from auto lenders who reposes cars and get a good deal? Any way to take advantage of higher used car supply to get a screaming deal? I have bought foreclosed real estate from lenders and bought short sales. But I know nothing about buying repo’d cars. A lender might get in trouble if it sells a repossessed car to an individual, and afterwards the defaulted borrower (who is responsible for the difference between the loan amount and the proceeds of the sale) claims that the lender didn’t get the maximum price for the car. Lenders need to show that the sale was above reproach and that it obtained the highest price for the collateral that the market would bear. An auction is generally the cleanest way to do this. Another reason – a more practical one – why lenders are not selling cars to individuals is the amount of work involved and the lack of expertise at the lender. Normally form out the whole process, from repo-man to auction. So sounds like you have to go to the car auctions. I used to know a guy that went to them a long time ago. From what I remember him saying the savings didn’t seem big enough for the hassle. Where do mom and pop used car dealerships (not dealer trade ins) generally get most of their cars? Auctions? To go to an auction and buy, you first have to be accredited with that auction. Franchised dealers (like a Ford dealer) wholesale trade-ins that are too old or have too many miles on them or have serious problems. The buyers are mom-and-pop used car lots. There is a whole ecosystem for these cars. Late model “luxury” cars with a few dents and scrapes will sell for 2/3 to 1/2 of a pristine cars price. You can run them thru a body shop and come out waaay ahead of buying a “clean” one. Chances are that you will have to attend several auctions before you get the “right” deal on the “right” car that you are looking for. If all you want is no particular brand or model, just a really good deal on a ride you MAY hit on your first visit. FYI – have cash available – no financing at the auctions! Actually, that’s not quite true. Ritchie Bros offers financing. They were pushing me a 50k loc for equipment purchasing. I realize that isn’t quite the same, but there are enough light duty vehicles that run through that auction. The scary part is, the salesman implied that it was based on credit score alone… That 50k is more than half I earn in a year! Remember all the hype around autonomous cars last year…? Aren’t the projections calling for a massive reduction in car ownership as car sharing paired with self driving becomes ubiquitous and safe? If so car ownership is in secular decline. Or was that all fake news..!? No one said this would happen in Q2 2018. I’m not an expert on the topic, but I personally think REAL driverless cars (i.e. no safety driver at all..fully autonomous), are a long way off. That is just my personal opinion and I could be wrong. I’m talking level 5, that go everywhere any other car goes unfettered. I think that is 10+ years until widespread. If not 20. They are certainly pouring billions into that and everyone is trying to do it. So who knows. This seems really short-sighted, an echo of Ford’s short-term thinking going all-in on sport-utilities in the 00s – “We make much more profit on SUVs, who needs cars?”. The market shifted when gas went up and they were caught flat-footed with outdated and mediocre sedans. Agreed, they’re going to be hurtin’ really bad when the next auto recession and/or major gas price hike hit. I get that the profits for them are in selling by weight, so to speak, but it seems like a very foolish, short-sighted decision. That’s so they can put out all the bad news all at once and get back to overpromising and getting their golden parachutes funded. I haven’t seen their financial statements in years, but I do recall that most of their business is actually financial services, and that manufacturing is a sideline. In the last crash GM got in trouble not that much for automotive operations but because their loan portfolio was hopelessly overextended. I spend a lot of time dissecting financial statements, but corporations are accomplished at using them for obfuscation. Of course they keep a separate set of statements for tax purposes that investors never see, and therefore I’d really like to see those. There’s a lot of information firms are entitled to withhold, and that’s a risk. There’s more I could say about such things but I’ve been waiting for articles with the right context. FED Printing money to subsidize labor union jobs, to keep politicians in the gravy…….. The Fed prints money to preserve the wealth and profits of predatory corporations. To claim that they do it to subsidize labor union jobs is absurd. People incur debt to buy things with money they don’t have, not to pay taxes on income they don’t have. BTW, maga hats and ‘Keep America Great’ banners are made in China and are not subject to tariffs. Surprise surprise. University of Michigan reports vehicle buying plans posted a significant decline in July, falling to the lowest level in five years. I saw that, interesting. July #s should be out later next week I believe. Wonder if it starts cascading down from here. Two more rate hikes this year won’t help, especially for interest rate sensitive buyers (lower price & sub). Industry chugging along but living on a knife edge. Should the Dow, S&P, Nasdaq and others correct in a big way in the next few months auto industry will fall hard as their more affluent customers will be impacted. I meant lower portion of Prime as well as sub-prime being most interest rate sensitive. the 10 yr rate makes no sense down here, inflation is roaring yet foreign buyers are keeping it in check…if rates rise rapidly, auto sector jobs will take hit for sure…it trickles down a lot…. An intersting fact, GM did sell their European branch, Opel/Vauxhall to France’s PSA ( Peugeot/Ctroën/DS ). Opel/Vauxhall had been bleeding red ink for years on years when run by GM, now Opel/Vauxhall reports a nice profit under French management. GM’s ownership of Saab comes to mind, RIP Saab and Ford’s ownerhip of Volvo Cars ….